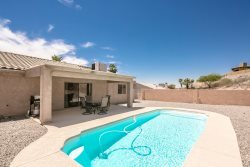 3 Bedroom, 2 Bath, Pool/Spa, located in beautiful downtown Lake Havasu City. Close to shopping, restaurants, beaches and launch ramps! Enjoy the bright, modern decor of this centrally located home in a quiet neighborhood. Relax in the beautifully landscaped backyard with your own private pool, spa, and built-in BBQ! This home offers a great area with the open Kitchen, Dining Room and Living Room for all your entertaining needs. The house accommodated all of our needs! The house has everything we need you don't need to bring anything, except for your food!